You are here: Home / All blog posts / Finalized the book contract! Previous post: I have a publisher!! I had a phone call with my publisher today, and we finalized the terms of the contract. They’re sending me an addendum today, and as soon as it arrives and I sign/return it, we’ll be good to go! I’m super excited and can’t wait to talk to an editor about how to proceed. The best thing about the conversation was that they mentioned that they’d been getting requests “from all over” for a book about the creative process…from the fashion institutes, from quilters, woodworkers, etc. – so that shows that there is a market for the book, and they’re well-positioned to take advantage of it. Hooray! The other great thing is that they want me to make it broad, covering all kinds of crafts! That was my original vision for the book, but I was advised to pare it down to something more targeted. The one difficulty is that including examples from all kinds of crafts means getting in touch with prominent artisans in many different fields. But fear not! Schiffer publishes in many different fields of craft, and they said they could connect me up with people if I wanted. So I’m thinking of expanding the book’s scope beyond just my experiences with craft and my creative process, and incorporating works/methods from artists in many different fields. That will, of course, mean more work. Quite a bit more work, actually. But it will produce a better book, so well worth the effort. Meanwhile, I’ve made some progress on Phoenix Rising. 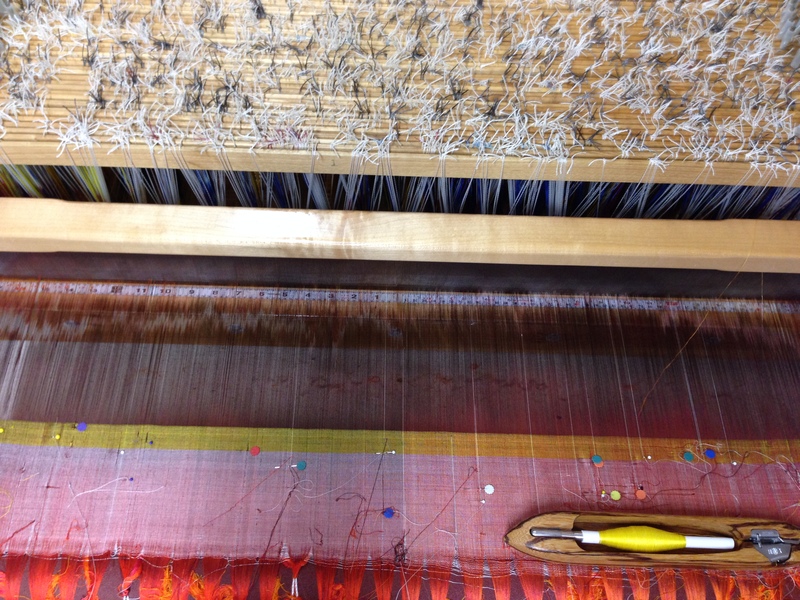 I have finished threading (20+ hours) and sleying (~7 hours), and am now finishing up debugging the warp (17+ hours and still going). The last problem I’m having is getting the threads at the bottom to seat themselves properly – the ones on the back twenty shafts are tending to float up above the top of the beater when the first twenty shafts are raised, resulting in broken threads. But I at least have the threading errors, sleying errors, tension problems, loose threads, etc. (lots of etc.!) straightened out. It all took longer than usual because the threads are so fine I can barely see them, but I bought a headlamp and it has greatly sped up the process. You can just see the white areas in the two warps that mark the start of the next section. I’m quite pleased with myself – I managed to line them up almost exactly. In cat-land, Fritz has also been in a state of surprised delight. As you may recall, Fritz has a shoe fetish – nothing pleases him better than sticking his entire head into a freshly-worn shoe, the better to savor the delicate bouquet. The stinkier, the better! And now you, too, can share his enthusiasm, through this short video of Fritz “appreciating” my shoes. Enjoy! Hooray!!! I’m so excited for you! My two cats also love our shoes! And congratulations on the book. Put the Weavers’ Guild of Boston down for a book tour stop – we would really love to have you speak about it and do a book signing. Thanks everyone! I’m super excited about the contract – it really opens up doors. And I’d love to visit the Weavers’ Guild of Boston – so if I come that way, I’ll definitely let you know!